Here is an original Reeders exercise that teaches you to move faster by developing your tonic neck reflex. This exercise trains the right (power) side of your body exclusively and teaches you to jump and spin around multiple attackers. There are some 50 variations; here is the first one I learned. An opponent and yourself stand facing each other right side to right side with the outsides of your right feet touching. Your right hands are also touching by and opposite your faces. Your head snaps backwards while your hand rotates downward trying to whip the outside of your opponent's thigh while he does the same. You then both snap your heads back to their original position, looking eye to eye, and rotate your arms back upwards trying to whip your opponent's head and then back down again to the thigh and up and down and up and down over and over for about two minutes. When executing the down strike you should bend your knees and gravity drop your body down with the down-whip and rebound upward in unison with the up-whip. Add to this motion a right roundhouse-kick (without stopping your up/down/up/down motion) with the up-hit when an opening arises. You can also jump and switch your body around and behind his right leg with your left leg when pressure is exerted on you. Sensing when and what to do is paramount to this exercise. You would also try to hinder your opponent's movement using your mind to project a feeling of helplessness to him/her. Many other possibilities will be shown in Matching Hands II. It is important to quickly and naturally select the appropriate movement to use to defeat your opponent over and over again without stopping. When one part of your body moves, all parts of your body should move. 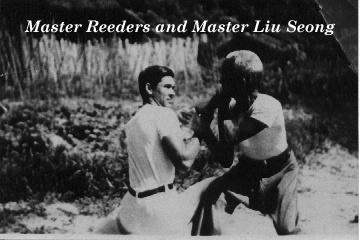 See photo with Master Reeders and Master Liu Sheong performing the matching hands exercise. This is a basic and very important way to train for combat in close quarters with continuous hitting while using your mind. You should be able to throw at least 300 strikes a minute at each other. Watch for Matching Hands II. Good Luck. Copyright © 1999 by Guy L. Savelli. ALL RIGHTS RESERVED.